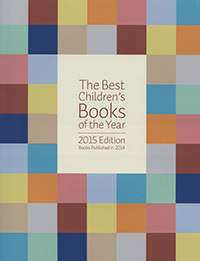 The Best Children’s Books of the Year, 2015 Edition includes more than 600 titles chosen by the Children’s Book Committee as the best of the best published in 2014. In choosing books for the annual list, reviewers consider literary quality and excellence of presentation as well as the potential emotional impact of the books on young readers. Other criteria include credibility of characterization and plot, authenticity of time and place, age suitability, positive treatment of ethnic and religious differences, and the absence of stereotypes. Nonfiction titles are further evaluated for accuracy and clarity. Each book accepted for the list is read and reviewed by at least two committee members and then discussed by the committee as a whole. We are very pleased to announce The Best Children’s Books of the Year is back in print! Purchase a print copy of the 2015 Edition for your collection for $10.00 (plus $3.00 shipping). Please contact bookcom@bankstreet.edu to place your order. ← Announcing the Inaugural Dorothy Carter Writer-in-Residence – Kwame Alexander! UNDERPANTS DANCE is a Bank Street “Best Children’s Book of the Year” for Humor. Check out the other great books here, too! “Out Of The Blue” made the 0-5 list! Definitely one of my favorite Barefoot Books’ titles! So wonderful to see it mentioned here. All Barefoot Books titles, like “Out of the Blue”, are available thru Ambassadors like me :-). Thanks for sharing this amazing information. The list will help me creating my own recommended book list.